Cathy and I have decided this will be the last linkup for Kaleidoscope of Butterflies for a while. We've enjoyed the quilts, butterfly photos, and ideas for creating butterfly-friendly gardens. We hope you have too. No live butterflies around here but I beaded one for the second Christmas stocking. Of course, the original idea was to bead a monarch but there's no need to be literal. I originally intended to let some of the felt show like the other ornaments. Got a little carried away. The mitten looks sweet. The snowman's carrot nose is perfect but he needs coal eyes. And it's all sewn down. Oops. You can tell I don't bead much: no consistent style but it's fun to try to figure these designs out. As long as they are bright and colorful, I think the grandchildren will be pleased. Several of the vintage fabric Chinese Coins are sewed into pairs and on the design wall. [For a nanosecond I considered making it completely random, without any layout. Fortunately I returned to my senses.] The fabrics are mostly blue, white, cream, and black although the two curtain cutoffs were cream with light green or red pinstripe plaid. I envision this quilt as quiet and old-fashioned but... it's just too quiet. I found one purple polka dot remnant from my sister's apron which inspired me to add a few more purples. What about a bit of red? InLinkz removed because it was hacked. I like the fact that you are really looking at the coins in terms of color brightness. When I did my low key batik blocks I added one little piece of bright orange-yellow in each row and everyone loved those. Those little touches of red you're adding are good. I find orange and lime green, even turquoise pack a punch. Keep up the good work! I don't think I've ever made a one-color quilt. It surprised me that this top was so close to that. Adding one color at a time is a completely different way to work for me. Usually I pull fabrics I like and add things to make them go together. I looked at your top with the orange strips and see it works with color similarly: a background color wash or single color then small bits of bright color to pop. Thanks. I hadn't considered this aspect. 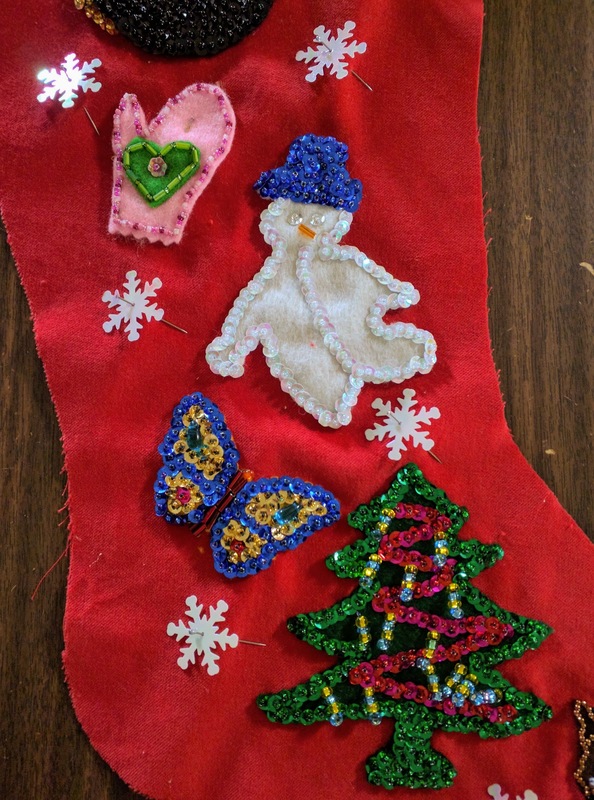 Your beaded butterfly is great, super Christmas stocking, I love it! Thanks, Janie. You are a better beader than I so that means a lot. I'm delighted you like this one, Julie Rose. It's one of my favorites, too.